The AMC10/12 will be given from 8:30 to 10am on Thursday, 2/15/18 in Plimpton. Anyone in Algebra 2 or above is welcome to participate! There are 40 spots available and they will be filled on a first come, first served basis. You can learn more about the contest right here. Practice problems are online here. Steven Wang Qualifies for the AIME! Steven Wang, Williston’s own 9th grade math phenom just qualified for the prestigious American Invitational Mathematics Examination by virtual of scoring in the top 5% nationally on the AMC12 math competition! 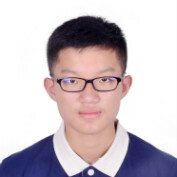 Steven will sit for the 3-hour AIME competition on March 22nd, the results of which could propel him to the USA Mathematical Olympiad! There’s been lots of competitive math action lately! Lots more upcoming too! T he 6th and last (!) 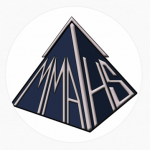 round of the New England Math League will be held on Tuesday, 3/21 from 2:30 to 3:30 in Schoolhouse 25. The competition lasts 30 minutes and you must begin before 3:10. You may use a calculator and any student at any level of math is welcome to participate! Just show up! No signup required! 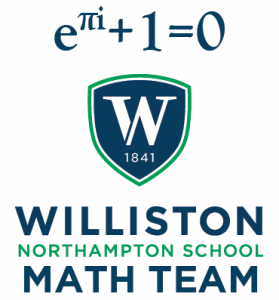 12 Williston Mathletes will be heading to Yale on Saturday, 4/1 to participate in the MMATHs competition! The two Williston teams of 6 will compete in individual and team rounds, as well as a round where they will work collaboratively with students from other schools! Yesterday, on February 28th, 5 Williston Middle School students participated in the 7th and 8th grade level of the New England Math League! This is the first time the competition has run at Williston! Congratulations to these middle school mathlete pioneers! Back on February, 15th, 28 Williston students participated in the AMC10/12 math competition! Students scores will be known in a few weeks! AIME here we come! On February 13th, 19 Williston students participated in the 5th round of the New England Math League, earning a strong team score of 25! Our overall team score of 120 puts us in 28th place out of over 130 teams from across New England! Complete round 5 league results can be viewed right here. Detailed individual results are online here (ask Mr. Seamon for the password). Congratulations to our current high-scoring students! Steven Wang is currently tied for 5th place our of all 800+ individual competitors! The 2017 American Mathematics Competitions 10 and 12 will take place on Wednesday, 2/15 from 8:30 to 10am in Plimpton. Anyone with any experience with at least Algebra 2 is welcome to participate! Everyone who wishes to participate must sign up using this online form by Monday, 1/30. There are 20 spots for each competition. Spots will be given out on a first-come first-served basis. The AMC 10 is a 25-question, 75-minute, multiple choice examination in secondary school mathematics containing problems which can be understood and solved with algebra and geometry concepts. The AMC 12 is a 25-question, 75-minute, multiple choice examination in secondary school mathematics containing problems which can be understood and solved with pre-calculus concepts. No questions on either competition require the use of a calculator. No calculators may be used during the competitions. The 2016 American Mathematics Competitions 10 and 12 will take place on Wednesday, 2/17 from 8:30 to 10am in Plimpton. Everyone who wishes to participate must sign up using this online form by Monday, 2/1. There are 20 spots for each competition. Spots will be given out on a first-come first-served basis. Two different versions of the contests are given on two dates, about two weeks apart, in February. Each AMC 10 and AMC 12 contest contain about 12 of the same math problems.